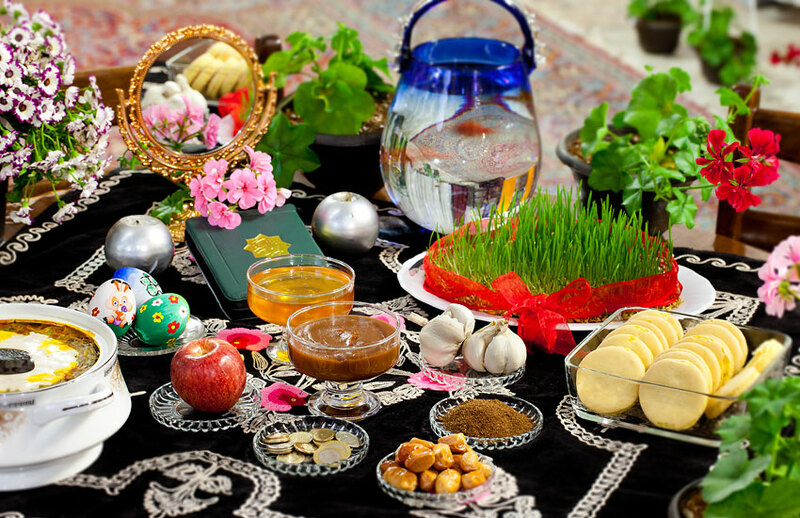 Nowruz Is One Of The Oldest And Most Cherished Festivities, Which Has Been Celebrated For Over 3,000 Years. Nowruz “The New Day”, marks the first day of spring and the beginning of the year in Iranian calendar. 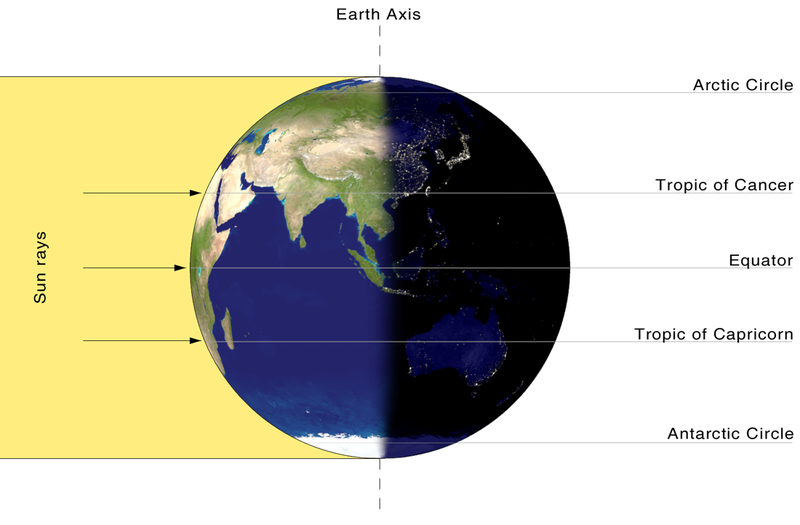 It is celebrated on the day of the astronomical Vernal Equinox which usually falls on March 21. According to astronomical calculation, the new Iranian year begins at "March 21, 2018, 1:15:28 Tokyo time". 1. 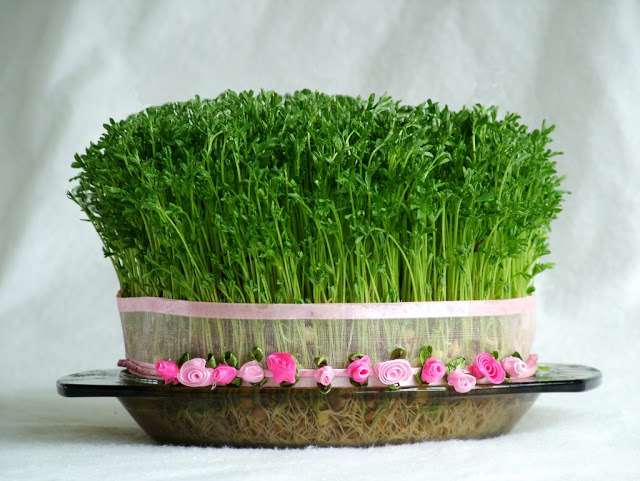 ﻿Sabzeh﻿ - Wheat, Barley or Lentil Sprouts growing in a dish, “Symbolizing Rebirth”. 2. Samanu - Sweet Pudding made from wheat germ, “Symbolizing Affluence”. 3. Senjed - Dried Oleaster-Wild Olive fruit, “Symbolizing Love”. 4. Sir - Garlic, “Symbolizing Medicine”. ﻿5.﻿ Sib - Apples, “Symbolizing Beauty and Health”. 6. Somāgh - Sumac Fruit, “Symbolizing "the color of" sunrise”. 7. Serkeh - Vinegar, “Symbolizing Old-Age and Patience”. A Mirror, Goldfish, Boiled Painted Eggs, Dried Nuts and Fruits and Coins are among the items Iranians include in their Haft Seen. Family members all dressed in their best, sit around the table and eagerly await the announcement of the exact time of vernal equinox over radio or television. The head of the family recites the Nowruz prayers, and after the time is announced, each member kisses the other and wishes a Happy Nowruz and elders give gifts to younger members of the family. In our family, the custom we were following as teenagers and younger, is amongst my sweetest memories. Right after the New Year announcement, regardless of the time, we were going to visit the immediate family member who was older than us, exchanging happy wishes and gifts, sitting for a chat, and eating some sweets and nuts. After a short while, we all were leaving to visit the next member who was older than us all. When the round﻿ was completed, w﻿e all together were going back to our house where my parents were waiting for us. Another round of exchanges and snacking would begin, but this time was lasting for hours. The occasion was so delightful that I was wishing it wouldn’t end. The first few days of the New Year are usually spent visiting relatives and friends. Each visit is reciprocated. 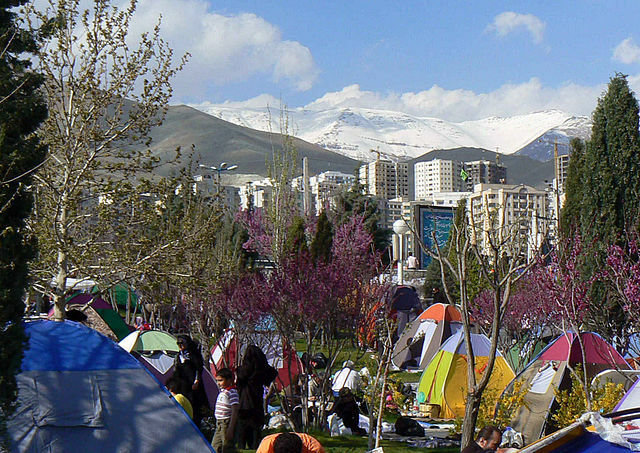 Nowruz Festivities continue for 12 days and on the 13th day “Sizdah Bedar”, “thirteen-in-the-outdoors”, people leaving the house and joyfully spending the day outdoors which have been a national tradition since ancient times in Iran. Sizdah Bedar was considered “The Blessed Day” of the month Farvardin “the 1st month of the year” from ancient Persian calendar. It marked the first day of Agricultural Activity of Ancient Persians. ​In this day Iranians go to have fun with their families all the day long. ​The essence of the Sizdah Bedar ceremonies is the enthusiasm to set up a family, lead a happy life and form friendship. People throw their Sabzeh, which has symbolically collected all the sickness and bad luck, into running water and young girls tie wild grass tops and wish for a happy marriage in the coming year. cooked for New Year’s Day Nowruz. Nowruz & Sizdah Bedar "Nature Day"